D23 (formally D23: The Official Disney Fan Club) is the official fan club for The Walt Disney Company. Founded in 2009, the organization is known mainly for its biennial exposition event, the D23 Expo. The name D23 refers to D for Disney and 23 for 1923—the year Walt Disney founded the company. Membership includes Disney twenty-three (a quarterly publication), yearly gifts, events, exclusive merchandise offers, and discount and early access to the D23 Expo fan convention. D23 was introduced on March 10, 2009 by Bob Iger during the company's annual meeting. D23 had a booth at San Diego Comic-Con in 2009 followed by the first D23 Expo on September 10–13, 2009. In March 2010, D23 announced that the expo would be biennial instead of annual with a Destination D event in the off year. In February 2013, the Walt Disney Company Japan announced the first D23 Expo Japan on October 12–14, 2013. In April 2013, D23 and TCM Festival teamed up for the 75th anniversary showing of Snow White and the Seven Dwarfs and a Kirk Douglas hosted showing of 20,000 Leagues Under the Sea newly restored from original camera negatives. Destination D (2010–present) a smaller biennial event alternating with the Expo. Light Up the Season (2015) original an annual event for employees to mark the start of the holiday season, D23 members have their own version on the studio lot which consists of carols, cocoa, and a tree lighting. The first D23 Expo was held at the Anaheim Convention Center in Anaheim, California on September 10–13, 2009. It featured pavilions from Walt Disney Imagineering, showcasing models and tests for future attractions, Corporate Responsibility, which feature a photo op, as well as projects for overseas troops and homeless shelters, Disney Consumer Products, showing the many products being sold by Disney within the next few years, a Disney Dream Store, costumes and props from the Walt Disney Archives, a Collectors Forum, where people from all over the country showcased and sold memorabilia. Events were held in the D23 Arena, Stage 23, Storytellers Theatre, and Walt Disney Studios Theatre. Many future projects were announced, including an expansion of Fantasyland at the Magic Kingdom, an extensive re-hauling of Star Tours for Disneyland and Disney's Hollywood Studios, a film based on the Beatles' Yellow Submarine, a fourth film in the Pirates of the Caribbean franchise, a new Muppet film, as well as clips and sneak previews promoting projects such as Prep & Landing, Tangled, Beauty and the Beast in 3-D, a set of viral Muppet videos, and a film series with Guillermo del Toro. Celebrity appearances included John Travolta, Nicolas Cage, Patricia Heaton, Kelsey Grammer, Tim Burton, Selena Gomez, Donny Osmond, Tom Bergeron, Kym Johnson, Betty White, Robin Williams, Joseph Fiennes, Johnny Depp (as Captain Jack Sparrow), as well as live performances by Miley Cyrus, Honor Society, and The Muppets. 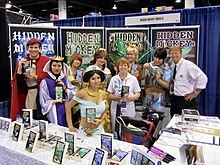 The D23 Expo returned for its second time at the Anaheim Convention Center in Anaheim, California on August 19–21, 2011. 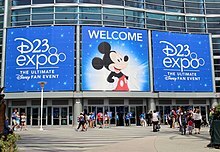 Closely resembling the inaugural D23 Expo in 2009, the Expo's show floor added pavilions for Disney Channel, Radio Disney, the Collector's Forum, Walt Disney Studios, Disney Living, Disney Corporate Citizenship, and Disney Interactive Media Group. The Treasures of the Walt Disney Archives has expanded by 12,000 square feet (1,100 m2) since the Inaugural D23 Expo. The show floor also featured a new pavilion, similar to the Walt Disney Imagineering pavilion from the D23 Expo 2009, Walt Disney Parks and Resorts's Carousel of Projects which shows the highlights of the developing projects coming soon in Disney Parks around the world. Shopping opportunities included the D23 Expo Dream Store returning from the inaugural Expo. Other D23 Expo-exclusive stores included Mickey's of Glendale from Walt Disney Imagineering headquarters in Glendale, California and the Walt Disney Archives Treasure Trove from the Walt Disney Archives in Burbank, California. Other stores include A Small World Village and a Disney Store in the Disney Living Pavilion. Another popular area was the Collectors Forum, where guests could buy Disney Collectibles and connect with the Disneyana Fan Club, Mouse Planet, Mice Chat, Hidden Mickey author Nancy Temple Rodrigue, and artist Brian Rood with his one-of-a-kind The Rocketeer. Events took place at the D23 Arena, Stage 23, Stage 28, the "red carpet" at the Talent Round-Up area, Storytellers Stage at the Disney Living pavilion, and at the Disney Channel/Radio Disney stage. The Disney Channel stage held performances from Coco Jones, China Anne McClain, a first look for Radio Disney's N.B.T. (Next Big Thing), and a karate exhibition from Leo Howard. Guests also had the chance to meet and greet the cast of Good Luck Charlie, Jake and the Never Land Pirates and The Never Land Band, Lemonade Mouth, So Random!, Phineas and Ferb, Kickin' It, Fish Hooks, A.N.T. Farm, Handy Manny, Special Agent Oso, Pair of Kings, and Shake it Up. Stage 23 hosted many events involving sneak peeks to projects from The Walt Disney Studios and ABC Studios including The Avengers, The Muppets, Brave, Monsters University, Once Upon a Time, and Prep and Landing: Naughty vs. Nice, and the celebration for the 25th Anniversary of Pixar. Stage 28 hosted Walt Disney Imagineering panels for the Disney Cruise Line, Cars Land, Buena Vista Street, Star Tours: The Adventures Continue, The Little Mermaid: Ariel's Undersea Adventure, "The Voices of the Parks", and vintage photos and videos of Disneyland and Walt Disney World. The first rounds of the UDTT were held on August 18, 2011 (one day before the D23 Expo) which narrowed from thousands to one hundred and from one hundred to 20. It was hosted by Dan Roebuck (guest starred in Lost and Wizards of Waverly Place) who narrowed down the final round from 20 people to 3. After two full days of trivia questions, John Kurowski was declared the winner of the inaugural Ultimate Disney Fan Trivia Tournament. His name was engraved on a Ludwig Von Drake trophy which was preserved in the Walt Disney Archives. Kurowski also won a preview cruise on the Disney Cruise Line's Disney Fantasy ship which set sail to the public in 2012. The D23 Arena hosted many milestone events only at the D23 Expo. This was the second time that the Disney Legends ceremony had taken place in front of guests at the D23 Expo; it had originally been held at the Walt Disney Studios in Burbank. At the expo, the company honored 12 people who contributed to The Walt Disney Company. This included Jodi Benson, Barton Boyd, Jim Henson, Linda Larkin, Paige O'Hara, Regis Philbin, Anika Noni Rose, Lea Salonga, Ray Watson, Guy Williams, and Jack and Bonita Wrather. The D23 Expo returned for a third time on August 9–11, 2013 at the Anaheim Convention Center. Disney officials later estimated attendance to be around 65,000. The Walt Disney Studios presented exclusive looks at live-action films including Saving Mr. Banks, Maleficent, Muppets Most Wanted, Tomorrowland, and Thor: The Dark World, as well as animated productions such as The Good Dinosaur, Frozen, Party Central, and Get A Horse!. Lucasfilm had its first appearance at the expo with the panel "Crash Course in the Force: Star Wars Saga 101" hosted by Pablo Hidalgo. Walt Disney Parks and Resorts showcased pavilions relating to Avatar Land, future Star Wars attractions, Marvel’s Avengers Academy on the Disney Magic, Disney Springs, and Shanghai Disneyland. The first D23 Expo Japan was held October 12–14, 2013 in the Maihama area at the Tokyo Disney Resort. This expo celebrated multiple anniversaries, 90th anniversary of the company, Tokyo Disney Resort’s 30th, Disney Channel’s 10th, Disney Mobile’s fifth, the Disney–JCB Card’s fifth and Dlife’s first. The fourth D23 Expo was held on August 14–16, 2015 at the Anaheim Convention Center in Anaheim, California. Pixar and Walt Disney Animation Studios presented first looks of The Good Dinosaur, Finding Dory, Zootopia, Moana, Toy Story 4, and Coco. Marvel Studios presented footage from Captain America: Civil War and concept art from Doctor Strange, while Lucasfilm presented a look at Star Wars: The Force Awakens. Walt Disney Pictures showcased Alice Through the Looking Glass, The Jungle Book, Beauty and the Beast, Pirates of the Caribbean: Dead Men Tell No Tales, Pete's Dragon, The Finest Hours, and Queen of Katwe. In addition, the logos for The Incredibles 2 and Cars 3 were revealed. Disney Interactive held presentations on several video games, namely Star Wars: Battlefront, Disney Infinity 3.0, and Kingdom Hearts III. The presentations featured new in-game footage, trailers, and reveals. The presentations also included surprise announcements and special guests. At the conclusion of the Walt Disney Studios presentation, Bob Iger made a surprise announcement that Disney was developing a new Star Wars themed land for both Disneyland and Disney's Hollywood Studios. Additional presentations included "Disney on Broadway: The Originals" celebrating the stage adaptations of Disney films by Disney Theatrical Productions, "FROZEN FANdemonium - A Musical Celebration!" which celebrated the music of Frozen, and a celebration of the 20th anniversary of the release of Toy Story. The second D23 Expo Japan was held on November 6–8, 2015 at the Tokyo Disney Resort. The fifth D23 Expo was held on July 14–16, 2017 at the Anaheim Convention Center in Anaheim, California. Pixar and Walt Disney Animation Studios presented first looks at Ralph Breaks the Internet, Incredibles 2, and Coco. Lucasfilm presented a behind-the-scenes look at Star Wars: The Last Jedi, Marvel Studios presented a first look at Avengers: Infinity War, and Walt Disney Pictures presented first looks at A Wrinkle in Time, Mary Poppins Returns, The Nutcracker and the Four Realms, and the live-action remake of The Lion King The cast for the live-action remake of Aladdin was also announced. Walt Disney Parks and Resorts revealed that both new Star Wars-themed lands in Disneyland and Disney's Hollywood Studios would be called Star Wars: Galaxy's Edge and presented a scale model of the land in its pavilion on the expo floor. There were additional presentations for Tangled: The Series and Olaf's Frozen Adventure, as well as a presentation celebrating the 20th anniversary of the release of Hercules. The New York Times estimated attendance for the 2017 expo at around 100,000 people. The third D23 Expo Japan was held on February 10–12, 2018 at the Tokyo Disney Resort. The sixth D23 Expo will be held on August 23–25, 2019 at the Anaheim Convention Center in Anaheim, California. ^ Hill, Jim (January 7, 2014). "Adam Sanderson is named as the new head of D23: The Official Disney Fan Club". Jimhillmedia.com. Retrieved January 20, 2014. ^ "Adam Sanderson Named Head of D23 and Walt Disney Archives". D23.com. January 7, 2014. Archived from the original on November 8, 2014. Retrieved January 20, 2014. ^ a b c d e Chmielewski, Dawn C. (March 10, 2010). "Disneyland history event will replace D23 Expo this year". Los Angeles Times. Retrieved September 20, 2016. ^ a b c Boucher, Geoff (July 10, 2009). "D23 at Comic-Con and beyond". Los Angeles Times. Retrieved September 19, 2016. ^ a b Todé, Chantal (March 11, 2009). "Disney launches fan membership program". DMNews. Haymarket Media. Retrieved September 19, 2016. ^ Chmielewski, Dawn C. (March 10, 2009). "Disney shareholders want say on executive compensation". Los Angeles Times. Retrieved September 21, 2016. ^ a b c Milligan, Mercedes (February 25, 2013). "D23 Premieres Japan Event This Fall". Animation Magazine. Retrieved September 20, 2016. ^ Zahed, Ramin (March 21, 2012). "TCM Plans 75th Anniversary Screening of 'Snow White'". Animation Magazine. Retrieved September 20, 2016. ^ McLean, Tom (February 9, 2015). "D23 Sets Full Year of Fan-Oriented Events". Animation Magazine. Retrieved September 20, 2016. ^ McLean, Tom (December 1, 2015). "D23 Fan Club Details 2016 Lineup of Special Events". Animation Magazine. Retrieved September 20, 2016. ^ a b McClendon, Lamarco (March 28, 2016). "Disney Sets Dates for D23 Expo 2017". Variety. Retrieved September 20, 2016. ^ "Disney's D23 Expo in Anaheim may be the start of something special | Hero Complex – movies, comics, pop culture – Los Angeles Times". Latimesblogs.latimes.com. August 24, 2009. Retrieved August 29, 2013. ^ Peters, Jayson (September 19, 2009). "D23 Expo: Star Tours II, Fantasyland expansion - Nerdvana: Sci-fi, comics, games & more - EastValleyTribune.com". EastValleyTribune.com. Archived from the original on September 19, 2009. ^ "Johnny Depp (in Jack Sparrow costume) surprises Disney D23 Expo audience | Hero Complex – movies, comics, pop culture – Los Angeles Times". Latimesblogs.latimes.com. September 11, 2009. Retrieved August 29, 2013. ^ "Miley Takes The Stage At The D23 Expo — Miley Cyrus — Photos & Pics". X17online.com. September 12, 2009. Retrieved August 29, 2013. ^ "Three Days of Magic". D23.disney.go.com. August 22, 2013. Archived from the original on April 21, 2013. Retrieved August 29, 2013. ^ "Treasuring the Past". D23.disney.go.com. August 22, 2013. Archived from the original on April 21, 2013. Retrieved August 29, 2013. ^ "Just a Dream Away". D23.disney.go.com. August 22, 2013. Archived from the original on April 21, 2013. Retrieved August 29, 2013. ^ a b "Collectors' Paradise". D23.disney.go.com. August 22, 2013. Archived from the original on April 21, 2013. Retrieved August 29, 2013. ^ "Disneyana Fan Club". Disneyana Fan Club. Retrieved August 29, 2013. ^ "MousePlanet - your resource for all things Disney". mouseplanet.com. Retrieved August 16, 2015. ^ "is Disney and Theme park news, tips, planning and more". Micechat.com. Retrieved August 29, 2013. ^ "The Art of Brian Rood". brianrood.com. Retrieved August 16, 2015. ^ Kit, Borys (August 20, 2011). "'Avengers': Robert Downey, Jr., New Footage Wow D23 Expo". The Hollywood Reporter. Retrieved March 21, 2014. ^ a b "Conversations with Pixar". D23.disney.go.com. August 22, 2013. Archived from the original on April 21, 2013. Retrieved August 29, 2013. ^ "Celebrating 25 Years of Pixar". D23.disney.go.com. August 22, 2013. Archived from the original on April 21, 2013. Retrieved August 29, 2013. ^ "What's Your Bid". D23.disney.go.com. August 22, 2013. Archived from the original on April 21, 2013. Retrieved August 29, 2013. ^ "Imagination Plus Engineering Equals Incredible". D23.disney.go.com. August 22, 2013. Archived from the original on April 21, 2013. Retrieved August 29, 2013. ^ "A Fantasy Come True". D23.disney.go.com. August 22, 2013. Archived from the original on April 21, 2013. Retrieved August 29, 2013. ^ Pimentel, Joseph (July 12, 2017). "Tens of thousands expected to flood Anaheim Disney's D23 Expo 2017, including Oprah, Mark Hamill; here's what you need to know". Orange County Register. Southern California News Group. Retrieved July 18, 2017. ^ Brooks Barnes (August 11, 2013). "Disney Fans Get a Sneak Peek at Coming Films". The New York Times. ^ Brigante, Ricky (August 10, 2013). "Walt Disney Studios reveal live-action films at 2013 D23 Expo: Marvel, Maleficent, Tomorrowland, Muppets, Saving Mr Banks". Inside the Magic. Retrieved August 17, 2015. ^ "'Star Wars' Set To Make Disney Debut At D23 Expo". Deadline. July 9, 2013. Retrieved July 27, 2013. ^ Curran, Brian (August 30, 2013). "D23 Expo: Crash Course in the Force". EndorExpress.net. Retrieved January 12, 2017. ^ Vejvoda, Jim (July 24, 2013). "Disney D23 Expo to Include Previews of Star Wars, Avatar Theme Park Attractions". IGN. Retrieved July 27, 2013. ^ "60 YEARS OF IMAGINEERING THE IMPOSSIBLE". Disney Insider. July 24, 2013. Retrieved July 27, 2013. ^ Sollosi, Mary (August 16, 2015). "Disney enchants with live-action movies at D23 expo". Entertainment Weekly. Retrieved August 17, 2015. ^ Couch, Aaron; Kit, Borys (August 16, 2015). "Disney Shows off 'Pirates 5,' 'Beauty and the Beast' at D23". The Hollywood Reporter. Retrieved August 15, 2015. ^ ""The Incredibles 2" Updates: Disney Unveils Official Logo At The D23 Expo; Edna Mode Another Superhero?". Venture Capital Post. August 30, 2015. Retrieved September 8, 2015. ^ Zacuto, Ben (August 18, 2015). "D23 Expo 2015: Pixar Presents 'Good Dino, Finding Dory, Toy Story 4, and Coco!'". Everything Pixar. Retrieved March 12, 2016. ^ "D23 EXPO: Disney Animation Announces Panels, Exhibits and More". Stitch Kingdom. June 15, 2015. Retrieved June 17, 2015. ^ "'Star Wars' Themed Lands Coming to Disney Parks, Says Bob Iger". Variety. August 15, 2015. Retrieved August 15, 2015. ^ Barnes, Brooks (July 15, 2017). "Disney Vows to Give Epcot a Magical, Long-Overdue Makeover". The New York Times. New York: The New York Times. Retrieved July 18, 2017. ^ Sisselman, Lauren (March 26, 2018). "D23 Expo 2019 Dates Announced". Bleeding Cool. Retrieved March 26, 2018. Wikimedia Commons has media related to Disney D23 Expo. This page was last edited on 11 April 2019, at 14:12 (UTC).